Baseball/Softball Parade and Opening Day - April 27! The annual Baseball/Softball parade will be held on Saturday April 27. The parade will march from Ritzer Field (behind Columbia High School) to Memorial Park in Maplewood. Players should wear their uniforms and "muster" at Ritzer beginning at 8:30 a.m. - the parade will get underway at 9:00 SHARP. (Note: Babe Ruth players are NOT expected to participate in the parade). The route will take the players along Valley Street to the Opening Day Ceremony in Memorial Park. Players should look for signs with their division (T-ball, Rookie, Minors, etc.) and then find their coaches and team. Coaches are encouraged to arrive by 8:20 am to help round up their players/team. Parents, you can march behind your child’s team or line up along the parade route. Either way, be sure to bring your camera! PARKING could be difficult. You will NOT be able to park in the lot behind Columbia High School where the parade will form. Parking recommendations include the student/teacher lot on West Parker, the Board of Ed lot on Academy Street, the teacher’s lot on the west side of Valley and local on-street parking near the high school. For those dropping players off who want to meet the parade at Memorial Park, consider on-street parking along the route or the train station lot on Dunnell Road. There is NO RAIN DATE for the parade. We will not be put off by a little rain! 1. Follow 'SOrangeRec' on Twitter to receive notification directly to your mobile device. 2. Call the South Orange Recreation Department code-a-phone at 973.762.0748. This is the same notification system we will use throughout the season so SAVE THIS INFO. If no message is posted or received for the current date, all activities will take place as scheduled. VOLUNTEERS are needed to assist with the local competition. If you are able/willing, please contact Rob Chibbaro at rob.chibbaro@comcast.net. QUESTIONS about the competition can be sent to rob.chibbaro@comcast.net. We use a service called Demosphere to keep track of our baseball schedules and (for the older players) the standings. You will want to bookmark this link!! After a rain-out, the schedules should be updated within 48-72 hours with the date, time and location of your make-up game. You are responsible for checking the site. If you have any difficulties, please let us know at sombaseball@aol.com. The schedule for individual and team photos on May 6 and 8 is provided below. Note: Babe Ruth teams do NOT take photos. Parents: Please confirm the date & time with your coach, as some coaches have requested changes. To prepay online, got to www.bassettiphoto.com/prepay and enter code "SOMB" for baseball or "MSOS" for softball to view your order form. If you prefer, you can download the order form or obtain an order envelope from your coach and return it to the photographer on picture day. You can also pay on picture day with a credit card. ALL players will be in the team photo but only those placing an order will be photographed individually. Each player will receive an iron-on Cal Ripken or Babe Ruth patch. It should be attached to the LEFT sleeve of his/her uniform. With performance jersey material, if the patches are not ironed on with care, you can burn a hole in the fabric. Use a 325 degree iron, no steam, and press for 8 seconds directly on the patch, avoiding contact with the jersey. If you take too long and apply pressure outside of the patch area, you can burn a hole in the garment. Additional precautions would include using parchment paper or another thin fabric, such as cotton, the limit the heat on the jersey. An alternative is to use fabric glue. It is available at all craft stores and will allow you to attach the patch without heat. South Orange Maplewood Baseball is a volunteer organization formed to assist the Departments of Recreation in a providing rewarding baseball experience for community children. The goal of SOM Baseball is to encourage participation, teach fundamentals, promote teamwork, sportsmanship and fair play and to foster a love of the game of baseball. 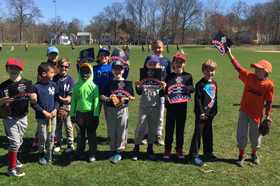 South Orange Maplewood Baseball is operated under the banner of the national Cal Ripken/Babe Ruth organization and is open to South Orange and Maplewood children ages 5 to 15 as of April 30. Also eligible are students who attend school within the boundaries of Maplewood and South Orange. SOM Baseball includes a spring recreation league for all interested children meeting the eligibility guidelines as well as a summer travel program with teams selected through competitive tryouts. Volunteer members of the SOM Baseball Committee work year-round on various functional subcommittees (listed below) to bring a quality baseball program to the community. New volunteers are always welcome and needed. Pick an area of interest and reach out to the committee chair if you would like to participate. The spring baseball registration period ended January 31. However, the South Orange Dept. of Recreation will continue to accept enrollment in person for a limited period of time in some age groups. Call 973-378-7754, ext. 2 for additional information. The success of the South Orange Maplewood Baseball Program rests with the many volunteers who help out in a variety of ways. Adult volunteers are needed for all teams to serve as coaches, assistant coaches and team managers (descriptions can be found in the handout). If you are willing and able, please sign up when you register your child! TO VOLUNTEER AS A COACH, ASSISTANT COACH OR TEAM MANAGER, CLICK HERE AND SELECT "VOLUNTEERS". The SOM Baseball Committee is excited to announce three new initiatives for 2019. And we will need your help to make them a reality. Please email Mark Calveric with any questions. 2018 Pitch Hit & Run Results! Congratulations to all the winners! A special thanks to the Columbia High School Baseball Program and the support of Coach Whalen and their players for helping run the event! The South Orange Maplewood Baseball Organization is divided into several subcommittees which meet year-round, working with the Recreation Departments, constantly reviewing and improving the baseball program. New volunteers are always needed. Please pick an area (or areas) where you would like to participate and contact the committee chair to find out when/where they will be meeting. ACT NOW!! Your kids thank you for your help! Registration: Responsible for organizing registration and coordinating volunteers to ensure all forms are correctly filled out and appropriate documentation is obtained for all new registrants. League Vice-President: Contact Bill Fitzsimmons. Publicity: Responsible for league communications and promotional activities., developing appropriate notices for all baseball functions and activities to be distributed as widely as possible to all schools for distribution to students as well as the News Record, the Gaslight, Village Green, Tapinto SOMA, the Village Website and the SOMBASEBALL website. It also collects and distributes appropriate news for presentation to news outlets. Works in conjunction with other subcommittees to ensure events are appropriately publicized. (Help Wanted: Interested in volunteering to help with League communications and publicity? Please contact Bill Fitzsimmons). Umpires: Responsible for recruiting, training and assigning of umpires for all Spring Recreation games. This includes the recruitment, training and supervision of school-aged young men and women to umpire in the League. The chair of this committee shall also be a member of the Rules subcommittee. Contact Matt Greenblatt. Coaches: Recruits and appoints coaches at the Minors, Majors and Babe Ruth league levels. Works with the Registration and Publicity subcommittees in the recruitment and registration of coaches during registration periods. Develops and oversees the training of all coaches within the League. Schedules and runs a mandatory pre-season coaches meeting to review League rules with all coaches at the Minor level and above. Selects pairings of coaches and responsible for oversight and evaluation of the performance of coaches during the season. Contact Doug Sasfai or Steve Livingstone. Coaches' Training: Responsible for scheduling and overseeing coaches' training programs for coaches at all age levels. Contact Chris Henry. T-Ball/Rookie Coaches: Recruits and appoints coaches at the T-Ball and Rookie levels. Works with the Registration and Publicity subcommittees in the recruitment and registration of coaches during registration periods. Develops and oversees the training of all coaches within these League divisions. Schedules and runs a mandatory pre-season coaches meeting to review League rules with all T-Ball and Rookie level coaches. Selects pairings of coaches and responsible for oversight and evaluation of the performance of coaches during the season. Contact Mark Hall. Registration: Responsible for organizing registration and coordinating volunteers to ensure all forms are correctly filled out and appropriate documentation is obtained for all new registrants. Contact Ron Iozzio. Tryouts and Team Selection: Designs and oversees the evaluation process so that every player has the same opportunity to demonstrate his or her skills. Supervises the draft for the upper level divisions and makes the player assignments for Tee Ball and Coaches Pitch divisions to ensure equally balanced teams. Contact Dave Maitlin or Lou Lombardi. Rules: Reviews Babe Ruth and Cal Ripken rules including any rules changes adopted on a national level to ensure local compliance with the rules. Proposes for adoption local rules for each of the divisions. Coordinates with the Umpires and Coaches Subcommittees to review the rules and changes with the umpires and coaches. Responsible for assigning rules commissioners and pitch counters for the upper divisions. This subcommittee is responsible for resolving all baseball related conflicts and protests that arise during the season. Contact Ed Matthews or Chris Nomura. Facilities: Responsible for working with the Recreation Department to help with upkeep and improvement of the baseball facilities. Organizes the Parent Work Weekend and other volunteer efforts to address issues relating to the baseball facilities. Contact Mark Calveric or J.R. Carlucci. Fundraising: Organizes and oversees all fundraising activities. Organizes the annual coaches’ softball game. Works with the Facilities and Program subcommittees to identify fund-raising initiatives. Contact Jerry Donaty. Program Committee: Responsible for overseeing the Spring Recreation League Program structure. It makes recommendations with respect to any modification of age or year groupings. End of season All Star Games. Works with the Publicity Committee to appropriately publicize these events. Contact Rob Chibbaro. Travel Baseball: Responsible for overseeing and coordinating the travel baseball program. Coordinates with the Publicity Committee to appropriately publicize tryout dates. Coordinates and supervises tryouts for each age group to ensure a fairness in the tryout process. Determines whether more than one team is appropriate at each age group. If there is more than one team at each age group the Travel Baseball Chair will interact with the respective coaches to determine how the teams are selected. Coordinates with the coaches at each age group to determine what leagues the teams are to play in. Coordinates with the Coaches Subcommittee to recruit and train coaches for the summer teams. It acts as the liaison between the teams and the leagues they are playing in to make sure the coaches are familiar with the rules and regulations of their specific leagues. During the travel season subcommittee members attend the games to evaluate how the teams are performing as well as evaluating the managers and coaches. As part of the manager/coach evaluation they conduct an end of season survey of the parents soliciting their views on the program as well as the coaches. These surveys are reviewed by the subcommittee and an end of season meeting is held with the coaches. The surveys are shared with the coaches. The chair of this subcommittee is expected to attend the District meetings as well ensure the coaches for the Red teams attend their individual tournament meetings. Contact Ed Matthews or Chris Caracciolo. Sportsmanship: Responsible for handling all sportsmanship related issues involving, players, coaches, parents and/or fans. Investigates all complaints and/or incidents and attempts to resolve all issues. After thoroughly reviewing a matter the subcommittee can propose a resolution which can include the imposition of an appropriate sanction against any person involved and found to be in violation of the league Code of Conduct. Sanctions include, but are not limited to, letter of reprimand, suspension, ban from attending any league games. Any sanction imposed is subject to review by the League President and Vice President. The Chair of this subcommittee shall keep the League President and Vice President updated on the status of any investigation. Contact Matt Lefferts. Technology: Responsible to identify and implement appropriate technology to assist in the proper functioning of the League. Contact Greg Dawkins. SOM Baseball League President: Kate Schmidt, Director of South Orange Department of Recreation. Please click here to send an email to South Orange Maplewood Baseball.